Das dreizehnte CD-Album in unserer Alhambra-Serie mit Werken des berühmten italienischen Komponisten Angelo Francesco Lavagnino päsentiert die Musiken zu zwei völlig in Vergessenheit geratenen und hier in Deutschland nie gezeigten Filmen. CALYPSO aus dem Jahr 1958 steht in der Tradition der in Italien damals beliebten exotischen Dokumentarfilme und verbindet ganz im Stil des zuvor entstandenen populären L´ULTIMO PARADISO den dokumentarischen Expeditionsbericht über die malerischen Inseln der Antillen mit einer fiktiven Liebesgeschichte zwischen einem Mischlingsmädchen und einem schwarzen Arbeiter und Sänger. Lavagnino hat dafür einen stark folkloristisch geprägten Score geschrieben, der mit ganz besonderem Charme die Calypso-Rhythmen der Antillen in reizvollen und mitreißenden Tänzen verarbeitet, aber auch mit zauberhaften elegischen und romantischen Klängen die Liebesgeschichte sowie diverse Nebenstränge des Films untermalt. Die erfreulicherweise sogar in Stereo vorliegenden Original-Bänder von CALYPSO, die hier zu Gehör kommen, stammen aus dem Nachlass des Komponisten und wurden uns freundlicherweise von dessen Töchtern zur Verfügung gestellt. Als Bonus enthält unsere CD außerdem die bisher nur auf einer unglaublich raren italienischen 10” LP verfügbare 20-minütige dreisätzige “Rapsodia Italiana”, die für den von Walt Disney produzierten und mit neun Kameras aufgenommenen kurzen Dokumentarfilm ITALIA ´61 IN CIRCARAMA komponiert worden war, der auf der Weltausstellung in Turin von Mai bis Oktober 1961 sogar täglich gezeigt wurde, um das damals ganz neue Circarama-Verfahren zu promoten. Dieses Werk zeigt den Sinfoniker Lavagnino von seiner besten Seite, denn es handelt sich hierbei um eine üppig schwelgerische und kraftvoll-dramatische sinfonische Dichtung für großes Orchester, die die touristischen Sehenswürdigkeiten Italiens äußerst plastisch vor dem geistigen Auge des Hörers musikalisch vorbeiziehen läßt. 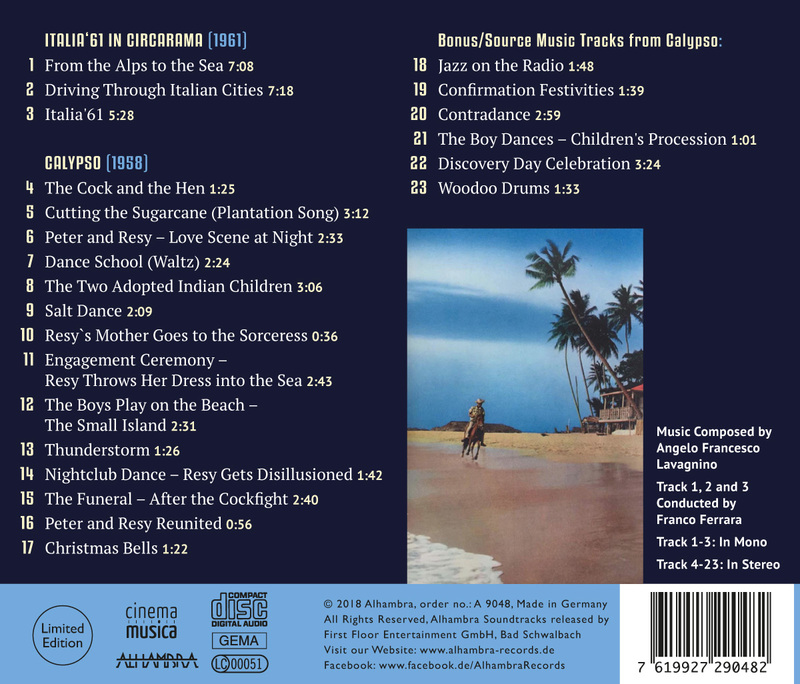 Alhambra Records proudly presents on this CD the world premiere release of two scores by Angelo Francesco Lavagnino: CALYPSO (directed by Franco Rossi) from 1958 is a love story set in the Caribbean islands and ITALIA ´61 IN CIRCARAMA (directed by Elio Piccon) is a short travelogue documentary from 1961 produced by the Walt Disney company to promote the then new Circarama format in Italy. CALYPSO was entirely shot on location in the Antilles archipelago with mostly non-professional actors and was released in colour and Cinemascope. It was a kind of follow-up to the previous Italian exotic documentary films from the 1950s and especially to L´ULTIMO PARADISO with which it shares for example the combination of documentary and feature film elements. 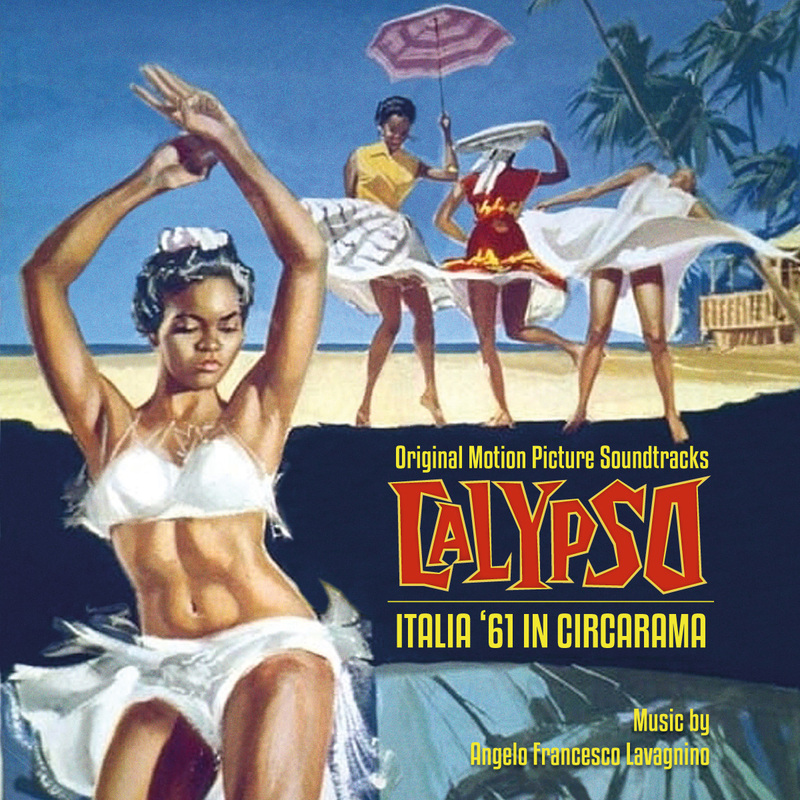 As the movie didn´t receive the same recognition, it has fallen into oblivion and nowadays is more or less a lost film.However, the tapes for Lavagnino´s marvellous score for CALYPSO have even been preserved in stereo. As he had done on some previous occasions, the composer had gone along for some time with the film crew to the locations where the film was shot to study the sounds and instruments of the local Afro-Caribbean folk music. He even incorporated a few marching band and carnival tracks of his own which are played during the festivities on the island. All these tracks can be heard in the bonus track section of our CD. The base of Lavagnino´s symphonic underscore is established through the yearning love theme with sumptuous strings for the film´s love couple Peter and Resy. Its most beautiful elaboration occurs during the engagement ceremony sequence where it gets whistled by Lavagnino himself with the addition of a mystical female choir which gives this track a truly poetic dimension. Especially the Plantation Song as well as the Salt Dance are infectious and delightful tracks which show Lavagnino´s melodic inventiveness at its peak: The colourful orchestration blends romantic high strings and stirring choir with the exotic sounds of a small calypso steel band in a completely original way. At the same time it also harkens back to Lavagnino´s previous efforts for the exotic documentaries L´IMPERO DEL SOLE and L´ULTIMO PARADISO. In 1961 Turin celebrated the centenary of the Italian unity with a large exposition which lasted from May till October of that year. One of the most popular exhibits was the 28 minute documentary ITALIA ´61 IN CIRCARAMA which was produced by the Walt Disney company and sponsored by the Italian automobile manfucturer Fiat. The spectacular views of this Cinerama tour of Italy (filmed with nine cameras) impressed more than two million visitors during the entire duration of that Turin Expo. As the original music tapes of Lavagnino´s score for ITALIA ´61 don´t exist anymore, we had to take the music from the only existing source: A top-rare 10” LP released in Italy in early 1962 which contained about 20 minutes of the music which were edited together (probably by Lavagnino himself) into three movements with the programmatic title “Rapsodia Italiana”.Indeed this lavish and splendid work by Lavagnino which has been written for a large orchestra must be called a true and fascinating symphonic poem which can stand on its own as pure music even without the visuals. and which will immediately remind many listeners of his previous work for LA GRANDE OLIMPIADE (also available on Alhambra records). This exciting CD project has only been possible thanks to the generous support of the three daughters of the composer – Bianca, Iudica and Alessandra Lavagnino -, who still had open reel tape copies of the original stereo tapes of CALYPSO in their personal archive which we were allowed to use. Our CD edition which contains a 12-page booklet with extensive liner notes and colour stills will be limited to 350 copies.